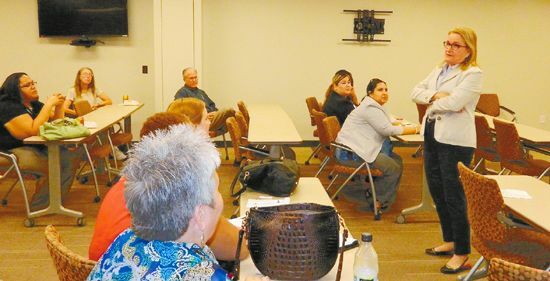 EAST HARRIS COUNTY – Emphasizing that her work in the legislature is based on input she receives from her constituents, State Senator Sylvia Garcia held a “networking” event last Wednesday evening at the Phelps Courthouse Annex in Pasadena. The event was open to the public, but in addition she had invited a cross-section of community educators and leaders, to talk specifically about Education, which she typified as the great “equalizer” among people. Garcia queried each person in the room, of which about 50 persons were in attendance. She asked each to describe some aspect of their experience with education, and what recommendations they had for her legislation. As examples, John Moon spoke of the need for more preparation for incoming college students, and more emphasis on 2 year programs instead of 4 year. San Jacinto College Chancellor Brenda Hellyer wanted to discusss motivating students to complete their studies, and to help them make a transition from high school. Pam Warfin of Lee College thought that more information was needed to get out to students, so they understood the potential for good careers and high pay that community colleges offered. Allatia Harris, vice-chancellor of San Jacinto College, noted that community colleges offered extensive workforce training, and were sensitive to diversity in their student body. She praised HB5 for moving the state back in the right direction. Several recent graduates praised the education they had received from community colleges. One revealed that she had no financial debt due to reasonable costs at her community college. Another mentioned that dual credits and AP classes in high school were quite helpful in giving a student a headstart when they go to college. This was echoed by Baytown city manager Bob Lieper, from his own college experience. Paula Henney, Galena Park ISD community liaison and GP Rotarian, said that involving parents was a key challenge, and led to success for their students. She said that GPISD has a “Parents Academy” to help with this effort. Star publisher Gilbert Hoffman summed up the various suggestions that had been offered, and added a personal story of how the East Aldine management district was helping finance a new Lone Star campus, knowing it would have far reaching effects on the lives of residents in the Aldine area. Senator Garcia thanked all for their contributions. She said that other issues she was concerned about were immigrant children and payday lenders, perhaps the subjects for another networking event.